This cute infographic on calcium is making the vegan rounds lately. At first it seems like an innocuous way to address the “where do you get your calcium” question. Think about it further, and you can see the danger of presenting data like this. Here’s the thing: 100 grams of raw chopped greens is about a cup and a half. That’s a lot to consume at one sitting. 100 grams of whole almonds is almost a full cup. 100 grams of parsley is about one and two-thirds cups. But 100 grams of liquid (such as milk) is only about a half cup, give or take. Comparing a small volume of fluid to a large volume of plant foods is a losing game – if you want the plants to come out ahead. There is a problem looking at nutrition through a reductive process that defines and judges the merits of a food based on its individual nutrients. Milk does in fact contain a number of substances that bodies need in order to function. It is, after all, the ideal food for vulnerable mammal babies. Based solely on these individual nutrients, milk’s “nutritional profile” is overall pretty good, and a couple swallows of milk is an efficient way to deliver those nutrients. Yes, milk also contains many substances that are not nourishing, dangerous in high doses, and frankly disgusting. But if we’re merely looking at the “box scores,” as these infographics encourage us to do, milk would be considered a healthy food. This seemingly anti-vegan rant helps illustrate why an ethical argument for veganism, not a health argument, works best. People will not be won over based on faulty or misleading nutritional claims (nor should they be). If they are, it won’t be for long. Nutritional science is still an evolving field of study. Research and evidence is scant, difficult to interpret, even contradictory. Food processing is an evolving industry as well, so we may see a day when cow’s milk is engineered to provide the most calcium per gram of any substance the world has ever seen. The ethics, however, are bulletproof. Consuming milk is cruel and unjust. It is cow slavery. The end. Interesting perspective. I don’t know that I agree 100%, but you have given me something to consider. Thanks! I so agree that using misleading information harms us, even when telling the absolute truth is not as dramatic. As soon as somebody catches the trick, nothing we say will be believable. I was going through the animal cruelty perspective (which I what I most care about), but I got some complaints for sharing disturbing posts about animal cruelty. Then I tried to argue veganism from a health perspective, and as you say, that can have its drawbacks too. Dairy milk is NOT good for human health, and causes an allergic reaction in most of us, so that is not misleading to share that information. However, the animal cruelty aspect trumps other considerations as far as I’m concerned. I agree fully with this post. Vegan arguments from health are doomed to failure as there is no reliable evidence – none – to suggest that a well balanced diet including meat, fish, eggs and dairy is unhealthy. The suggestion that “most of us” have an allergic reaction to dairy is the kind of exaggeration that makes us look crazy. (Even populations with a genetic tendency to lactose intolerance have large numbers who eat dairy with no problem at all). Vegans using the health argument tend to compare an optimal vegan diet with a terrible omnivorous diet. All of the populations used as examples of optimal diets in health terms – mediteranean; okinawan; rural chinese etc – are omnivorous diets in that they include some meat or fish and often eggs and dairy also; but generally in much smaller amounts than typically consumed in a modern developed-world diet. There is no vegan population that can be compared to a culturally coherent society such as these (or that these were in the past at least) and very little long-term evidence with large numbers of participants (especially of vegans who have been vegan for effectively their entire lives) that can be used to claim superior health for vegans. My guess is that a well planned vegan diet is pretty much equivalent in health terms to a well planned omnivorous diet. The vegan argument is essentially an ethical argument, and possibly an ecological argument also (although this is far from as clear cut as many vegans like to think) and hitching our wagon to arguments that cannot seriously be defended discredits us. We can argue that only a small quantity of animal food in a diet is generally consistent with good health and that current intakes are grossly excessive but the next step – the argument for vegetarianism and veganism has to be ethical to stand a chance of being convincing. The excellent work of vegan dieticians such as Virginia Messina, Vesanto Melina, Jack Norris etc gives us the tools to be healthy vegans and to persuade others of the healthfulness of a vegan diet but they are not (and are not explicitly intended to be) arguments for the clear superiority of veganism over omnivory per se. Sarah, I feel any time we make absolute claims one way or another about health, we’re setting up a fail. Dairy may be good, may be bad, some people who smoke and eat animal products live to 105 years old, some cultures have nonexistent rates of this cancer but not that cancer – it’s a big jumbled mess of data. Even if you are convinced by your evidence, so many people lack the critical thinking skills to understand or accept it. I would keep on trucking with the ethical outreach. Disturbing images/stories of animal cruelty certainly aren’t the only ways to make your point. There are also inspiring stories, like rescues. Sanctuaries often do a good job of raising awareness around the issues without getting too…depressing, I guess is the word. With Beagle Freedom Project, we talk about the ethics of using animals in laboratories, but in a palatable way that puts a face, a name, floppy ears and a waggy tail on the issue. Pretty much every line of it is quotable, but she mentions something I should have covered too. There are compelling human health arguments to be made for ending animal testing, and cruelty-free vegan personal care products tend to be healthier, but there are elements of veganism for which there are simply no health angles. Wearing leather, feathers, or wool is not a health hazard. Going to the zoo or Sea World might be, if you slip and fall. Adopting a pet instead of buying from a breeder has no health impact. Etc. While I am Vegan because I respect ALL Earthlings and Mother Earth, I support ANY and ALL advocacy of Veganism. We are a very narcissistic and bewildered herd, so unless your demographic is primarily other Vegans…!? BTW, we cannot “assimilate” the nutrients from another mammals milk for many reasons, but one very elementary reason is the molecular structure is simply too large. Since 95+% of all nonhuman animal abuse starts on our plates, I will continue to promote Veganism to as many factions of our herd as possible! I think you overestimate humans ability to reason, and underestimate your own awareness and intelligence, relative to the majority of our herd. I’ve decided to try and cut out dairy products. I recently tried Almond milk for the first time and didn’t mind it at all. I found it to be great with cereal and am looking forward to trying the other flavours Silk Almond Milk has to offer like chocolate and vanilla. Though it will be a change for my taste buds to get used to I feel much better about myself consuming something that an animal didn’t have to suffer for. 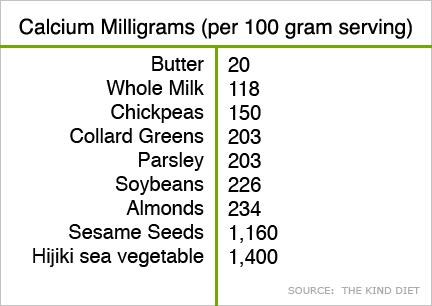 This article is great I never realized almonds had more calcium benefits than milk by a long shot.